Although numerous books and articles have recently talked about the gut instincts as valuable in giving us useful hunches in the decision-making process, "What's Behind Your Belly Button?" goes much further and explains how gut feelings not only have a psychological intelligence of their own, but are also understandably rational in their functioning. 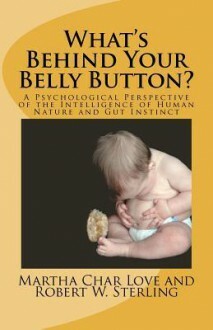 The authors explore how gut feelings are like a gas gauge in our guts indicating through an emotional feeling of emptiness or fullness how well the two instinctive human needs for acceptance (attention from others) and of control of one's own responses (freedom) in our lives are being met and how our behavior attempts to keep these two instinctive needs in balance at all times. They explore how these two instinctive needs motivate nearly all our behaviors all through our lives and that the feeling memory of how well these needs are met from moment-to-moment may be accessed through somatic awareness of our gut feelings of empty and full by using the Somatic Reflection Process the authors have developed. In 1998, neurological research at Columbia University published the work of Dr. Michael Gershon that identified the enteric nervous system as a center of feeling-intelligence in the gut, which he called the "Second Brain". The authors carefully examined this material and accepted the research findings as pointing to the same universal feeling intelligence they experienced in counseling with hundreds of people. Utilizing the research of Dr. Gershon, the work of Dr. Lise Eliot who charts the development of children from conception through the first five years of life, recent research of their own in the Psychology Department at Sonoma State University, and their vast clinical experience, the authors have presented an interpretation of recent medical research into a Gut Psychology and a more accurate behavioral understanding of the Self and human nature than has previously been available. They share a complete protocol and results of clinical research findings for the Somatic Reflection Process that they have created and used successfully, with themselves and hundreds of people, to assist the process of getting in touch with the voice of the gut and learning to follow its wisdom toward a healthy life--unifying the body-mind split in the individuation process. Over a period of 45 years, there has been a utilization of further graduate studies in Depth Psychology and Religious Education on the part of the authors, and giant steps forward in the fields of Neurology and Human Psychology, which help form a new more accurate image of human nature. The authors present this new image of human nature and the meaning of its understanding in making positive changes in our lives. They suggest that we are at the beginning of a Renaissance in human consciousness and that understanding our true human nature is the way to thrive in this present era. This book also discusses the implications of this new image of human nature in education and for rehabilitation of those incarcerated. The authors suggest that early in the child learning process, care be taken to offer the experience of freedom and acceptance to the preschool child to form a positive self-concept and to self-regulate his and her behavior as part of the learning process in becoming a loving, caring person. After careful examination of life's processes, they conclude that of all the mammals in the animal kingdom, humans seem to be the only species that has been denied the open use of their natural instincts. Out of ignorance, fear or wanton control by others--"we are denied the use of the brains we were born with". This awareness is of growing concern since the absence of the use of the feeling intelligence of the body interferes with a major stabilizing force--built into the human system--that can affect human behavior, provide a sense of well-being, and the ability of the body to combat disease.